Dynamic Search Ads (DSA) are one of the easiest ways to increase your reach and find more opportunities without any keywords research. Targeting for dynamic search ads works by matching people’s searches on Google with specific pages on your site. And of course, you’re in control of how this target works. Use Google’s index of my website. Dynamic search ads pull the data from Google’s organic search index. Your website content must be indexed in order to be eligible for DSA. Use URLs from my page feed only. You use a spreadsheet of URLs to specify precisely which URLs to use with your Dynamic Search Ads. Use URLs from both Google’s index of my website and my page feed. A hybrid approach of your organic index and your page feed. In this post, we will be covering the page feed source and how to structure your DSA campaigns in a brilliant and organized way. Why should you use page feed for Dynamic Search Ads? Full control over your promoted URLs where you can specify which landing pages to be triggered dynamically. Advanced bidding, reporting, and monitoring using custom labels. You can create different campaigns/ad groups based on your custom labels, so you can increase/decrease your bids on specific products, exclude specific categories…etc. How to use page feed for Dynamic Search ads (DSA)? Page URL: the landing page you want to target. Custom Label: the label will help you target your ads. You can download the page feed template from here and fill it out with your data. 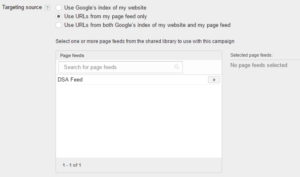 Navigate to Shared Library in your AdWords account and go to Business Data and upload your page feed. Once the feed is uploaded successfully, you will see all your URLs and all custom labels under items. This step is optional, but it’s recommended. 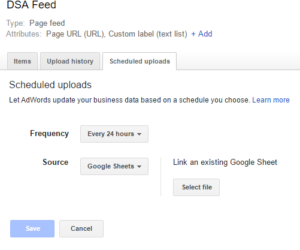 You can host your feed on Google Spreadsheet and add a schedule for Google to crawl the feed (hourly, daily, weekly..etc). For example, let’s say you have a custom label in your feed that indicates the availability of products (In_stock, out_of_stock). Your team can update the spreadsheet and changes will be reflected automatically in your campaigns without having to re-upload the feed each time something changes. 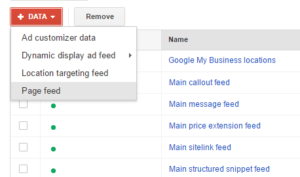 In your campaign select the Auto targets tab and click + Dynamic ad target, then enter your custom label that you want to target and save. Also, bid modifiers can be applied to custom labels. Google always works on improving the quality and flexibility of dynamic search ads targeting. As DSA campaigns have proven to bring good results with a lower CPC and hence a lower CPA. Thanks for sharing this. Want to check, how did you schedule a crawl of the feed via Google Sheet? The only option I had was to upload a CSV file. You need first to upload your CSV file and then you will be able to add and schedule a google sheet as in step num 3. Great article – do you need to do #5 or will Google just match ads to whatever custom labels are on the feed?